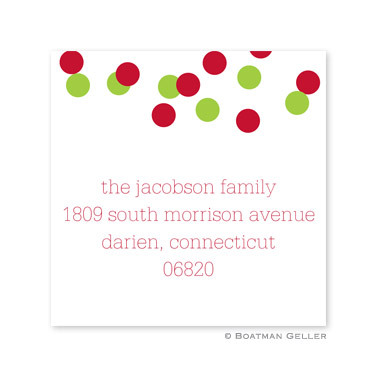 Description: Boatman Geller's 2.5" square stickers are fabulous to use as gift stickers, book plates, home-baked or canned stickers, or just for fun. Stickers include 3 lines of copy and a variety of ink colors (pink, navy, red, bright green, dark green, brown or black) and font styles. Specify your personalization! Pricing: 24 for $30, 48 for $40, 72 for 604, 96 for $76, each additional 24 for $19.